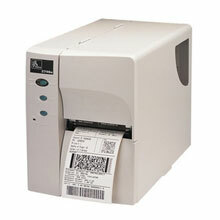 Zebra 2746e - Thermal transfer, 203 dpi, 4" print width, RS-232/USB/Ethernet interfaces. Includes US power cable. Interface cables sold separately. The steel-enclosed 2746e represents an affordable, basic barcode print solution for entry-level applications that specify a durable metal printer. New feature enhancements on the 2746e include expanded connectivity capability (e.g. standard serial, parallel, new USB, and internal Ethernet option), upgraded electronics, improved ribbon spindle design, additional memory, and intelligent built-in media tracking capabilities that provide additional value and reliability and a compelling sales argument. The 2746e's moderate duty cycle output capability is ideal for individual or batch labeling applications within warehousing/distribution, air freight/parcel tracking, manufacturing, and office printing. Its sturdy metal frame and intuitive design make the 2746e a natural choice for users who need a dependable, full-size, easy-to-use, 4 inch (101.6 mm) printer. The Zebra 274E-10411-0010 is also known as ELT-274E-10411-0010	or 274E104110010	.